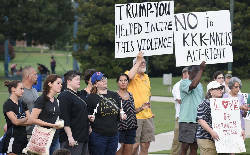 A rally to stand with Charlottesville, Va., in the wake of deadly protests there over the weekend drew a crowd of several hundred and a police presence to monitor the event in Coolidge Park on Thursday night. Despite concerns by some who chose to stay away for fear that the same kind of violence seen in Charlottesville could be mirrored in Chattanooga, tensions never escalated beyond a few heated conversations between a few protesters and counterprotesters. A few dozen police officers ringed the edge of the park in pairs, watching the crowd of approximately 300 people carefully as they assembled, chanted and sang in solidarity with those who protested against white supremacists over the weekend. "One of our own was murdered, a bunch of people on our side have gotten beaten and suffered a great violence," said Kayla Harris, the event's organizer. "I was really upset about it and I wanted to show Chattanooga and I wanted to show America that Chattanooga will not tolerate Nazis or white supremacists." She said the sides of the debate are clear and President Donald Trump has exacerbated the problem by refusing to singularly condemn the actions of white supremacists in Charlottesville. "By his actions and other things that he has said and not said, he has encouraged racist, transphobic and homophobic people to come out, and feel more comfortable coming out," she said. "Only one side showed up with torches and guns and their own militia. Only one side killed somebody." Harris also roundly condemned a post on the rally made on Reddit on Monday that encouraged demonstrators to avoid bringing children and bring firearms for protection. She said she didn't know who posted the message and said it was antithetical to the intent of the rally. Not everyone in Coolidge Park was present to speak out against white supremacists. Robert Fletcher stood with an American flag draped over his shoulders as the crowd sang "This little light of mine" and he said he was there to stand in opposition to many of the crowd's collective political views. "I'm here standing up for what I believe in," he said. "They want open borders, I don't. They want to destroy history, I don't." Fletcher also said he and some of his friends were in Charlottesville over the weekend. "I'm peace. We were there to prevent any acts of violence because the police stood down. I'm here for the same reason tonight," he said. Tensions during the event became most heated around a small group a hundred yards from the stage that gathered around several young men arguing about race, politics and several other issues. At the center of the debate was a black man, Isaiah Moore, who debated with a white man holding an American flag who refused to give his name. As their argument continued, onlookers ringed in around them to film the encounter with their phones and police moved in to keep a closer eye on the exchange. 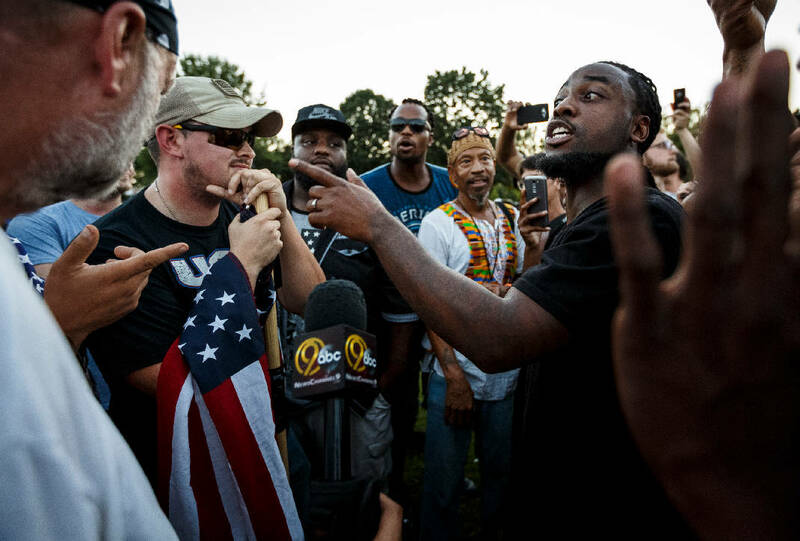 "The more you talk about race, the more you exacerbate the issue," said the man with the flag. "What I want to see is an end to 'thug culture.'" Moore fired back, saying more white people need to realize their experiences in America are qualitatively different from those of others because they have never been exploited or persecuted in the same ways. "Everybody wonders why we get mad and protest," he said. "It's because we've been doing this since the '50s and the '60s." Some showed up to the rally because they had more personal connections to the issue: Anna Grabowski said she came because her uncle was killed fighting in World War II when his plane was shot down by Nazi forces near Germany. On Thursday she held a sign that read "No Nazis No KKK No Fascist USA." "There are definite things that are completely mirroring with the stereotyping and scapegoating and trying to blame minorities for economic problems," she said. "Whenever there are terrible economic difficulties, those kinds of ideologies have gotten fertilizer on them." She said the events in Charlottesville should be a reminder to all Americans that it is essential to respond to any fascist resurgence with unyielding resistance. "Some people say just ignore [white supremacists] and they'll go away, but they haven't. You can't ignore it. You wouldn't ignore a fungal infection, you've got to take some medicine for it," she said.